Aqua Leisure is an innovative Boston-based pool products company. When they needed to pull together marketing videos and photography for a new line of products in the dead of winter, they came to South Florida and teamed up with Plum Productions. Create Marketing Video featuring Aqua Leisure’s new product line, Pipeline Go, to be shown during presentation to buyers at large US retailers including Sam’s Club. Capture Professional Photography to be used on product packaging and marketing efforts. 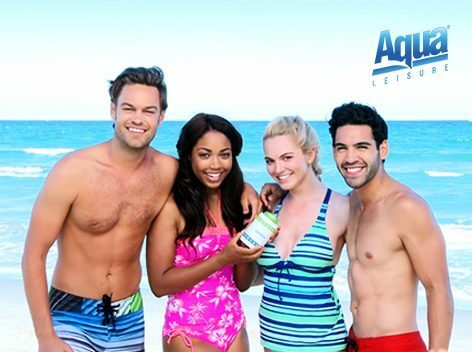 Because Aqua Leisure is based in the Northeast, they relied on Plum Productions to coordinate all aspects of the production before this multi-day shoot. We established an overall vision, and then got to work delivering options to the client that fit within their budget. We worked with our casting agency to find talent that met the client’s criteria, and then provided a book of options for them to make the final selections. We scouted dozens of locations, narrowed down the choices and presented them to the creative team at Aqua Leisure. The client arrived in town the night before the shoot, and left the day after. Plum Productions handled every facet of the project prior to their arrival to minimize the client’s time in the field. In the end, we shot about a dozen products in three full days at three different locations with four models and countless wardrobe changes. Controlling floating pool products requires a lot of fishing line. Everyone likes Publix subs, even models. A 6-foot sun umbrella has a radius of 3 feet, not 6. We never said we were smart.